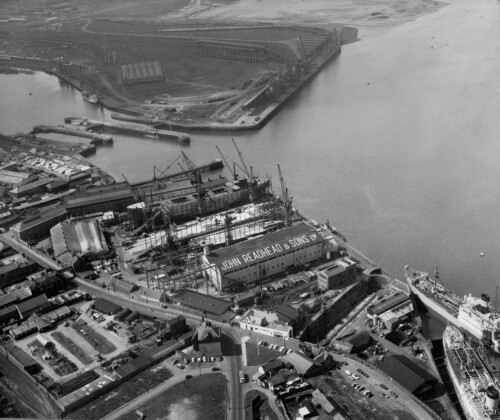 The shipbuilding collections at Tyne & Wear Archives are widely recognised to be of outstanding historical significance. They have attracted international research interest and back in 2013 were given official recognition through their addition to the UK Memory of the World Register. 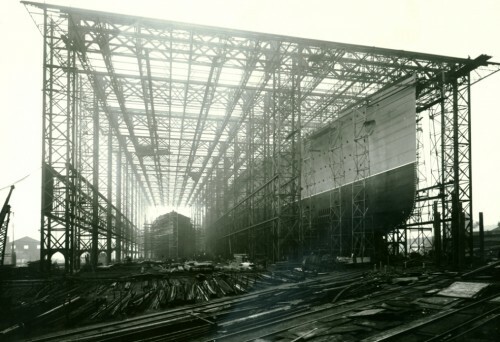 Photograph of the great ocean liner ‘Mauretania’ under construction at the Wallsend yard of Swan Hunter and Wigham Richardson Ltd, September 1906. Over the past seven years we’ve made huge strides towards our goal of making all our shipbuilding collections available to the public. We’ve catalogued the historic records of Swan Hunter, Vickers Armstrongs and eight Sunderland shipyards, making many important historical documents available to the public for the very first time. We’re delighted to report that we’ve just taken another big step forward with the completion of our project to catalogue the archives of John Readhead & Sons Ltd, shipbuilders of South Shields. Readheads was a prolific firm and built over 600 ships from 1865 to 1968. It played a significant role in both the region’s shipbuilding history and the development of South Shields. The catalogue contains nearly 2000 entries and will be of interest to a wide variety of researchers including academics, local historians, maritime researchers and genealogists. 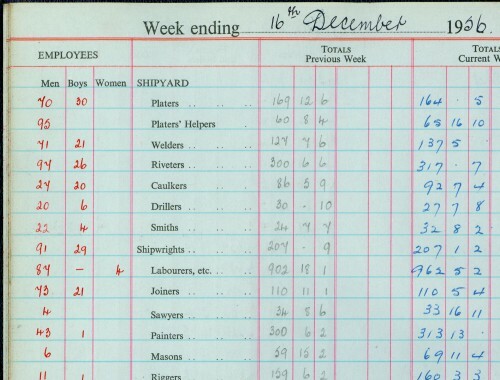 Visitors to our archive searchroom will at last be able to access the whole collection including board of directors minutes, personnel records, cost books, ship specifications, ship plans and a large quantity of previously unseen photographs. The collection is especially rich in historical photographs of the ships built by Readheads and of the shipyard itself and we’ve published over 50 images from the collection online on our Flickr pages. Photograph of First World War Patrol boat P-31 at the mouth of the River Tyne, 1916 (TWAM ref. DS.RDD/4/PH/2/1). This vessel was built by John Readhead & Sons, South Shields. During the project I’ve been able to share interesting discoveries from the collection as I’ve come across them via the Archives twitter account https://twitter.com/TWArchives. 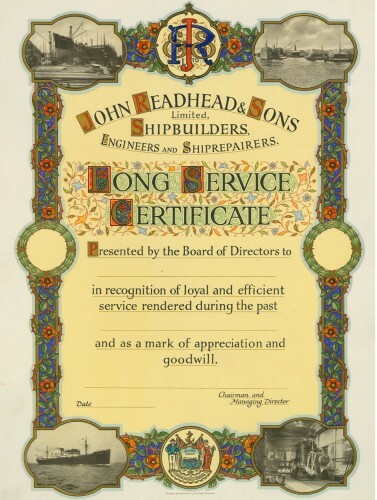 Some items have caught my eye for their beauty, such as this long service certificate dating from the 1930s. 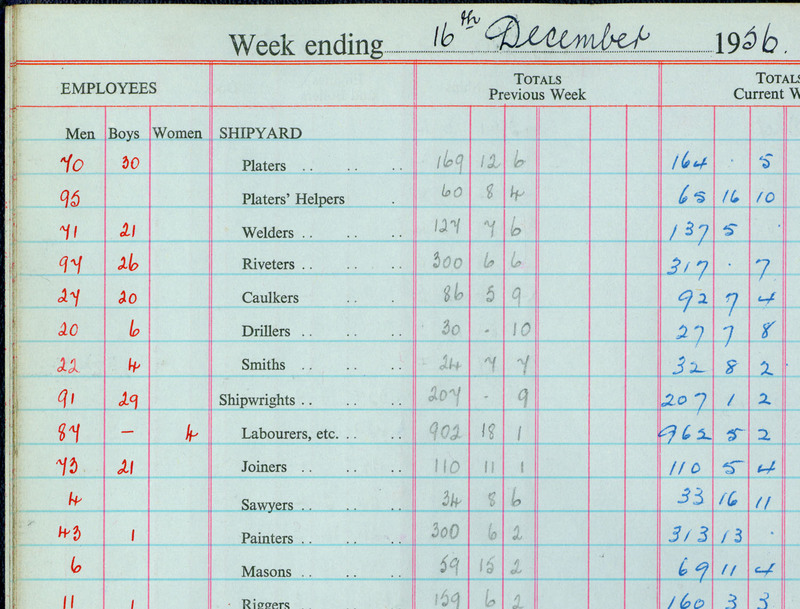 Other documents have surprised me such as this wages summary book dating from 1956, which showed women working as labourers in the shipyard long after the end of the Second World War. The collection contains hundreds of fascinating documents. 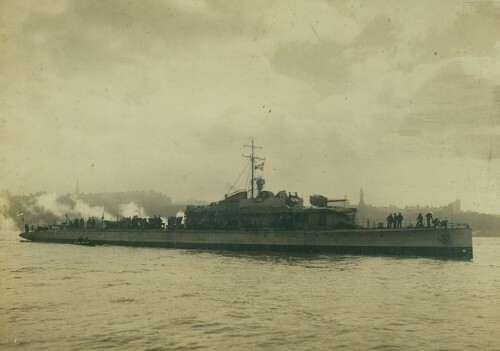 If you’d like to explore the region’s shipbuilding history or look through some of our other fascinating collections then why not pay us a visit. You can find details of our location and opening times on our website. The Readheads project has been made possible thanks to a grant from the Sir James Knott Trust and I’d like to take this opportunity to thank the trustees for their generous support.